Our branch of the Leucht Family Tree has been traced back to the year 1748 to Zaulsdorf, Vogtlandkreis, Sachsen, Germany (near Oelsnitz and Plauen). This page traces back the history of the Leucht Family from myself, back to my great-great-great-great-grandfather! You have got to check out this new site! It is hosted by an open source program called phpGedView that allows many separate registered Internet users to make modifications/corrections to one single GED file. All the manually typed information contained in the web page below will be put into this new robust and highly automated web program. Then the info will be permanently deleted from below. The only data that the general (non-registered) public can view is data in non-living individuals. So it's completely safe from identity theft and spammers, but still allows family members to register and view all of the data for everyone in the database. If you're even remotely related to me (either by blood or by marriage), you seriously need to register for this new Leucht genealogy site! Once registered, you can view the whole database and you can even make online changes and corrections! That would help me a ton! Misc: Tom grew up in Peoria, IL. He was a Korean War Army veteran and a member of Christ Lutheran Church. Tom worked as a shipping and receiving clerk for Carson, Prairie, Scott & Co for 28 years and retired in 1984. He was a member of, and served as secretary for, several Peoria area bowling leagues. Misc: Jack grew up in Peoria, IL. He married Marjorie Brown and they had two children: Jacqueline Leucht (now Smith) and Kay I. Leucht (now Foote). Marjorie died on 4/9/1985. Jack was an Army Air Force veteran of World War II. He worked at Bergner's in Peoria for 27 years. He was a member of the Lutheran Church and a former member of VFW Post 8662. Jack retired from Bergners Department Store as a window designer & . Misc: Betty grew up in Peoria, IL. She retired from Block & Kuhl (Carson Prairie & Scott Department Store as a sales clerk & buyer. Misc: Walter was born in Germany. He married Lona Schneider in Peoria, IL on 8/29/1935. Walter and Lona had two children: Jane Leucht (now Williston) and Charles Leucht. Walter was a toolmaker at Caterpillar Tractor Company. Lona died on 8/25/1960. Misc: Verna Irene married Charles Bishop (date unknown). Verna Irene then married Kurt William Leucht. She and Kurt had four children: Jack Dean Leucht (4/25/1924 to 1/1987), Thomas O. Leucht (11/7/1931 to 7/24/1999), Betty Joyce Leucht (now Stimeling) (10/12/1921), and William Kurt Leucht (2/20/1943). Misc: Kurt William grew up near Plauen Germany. He came over to America with help from the Lutheran Church on 7/29/1914 at age 18. According to Ellis Island Records, Kurt arrived in New York on The Vaterland, which was the largest ocean liner in the world between 1914 and 1921. Kurt settled in Peoria, IL and married Verna Irene Pickard. They had four children: Betty Joyce Leucht (now Stimeling) (10/12/1921), Jack Dean Leucht (4/25/1924 to 1/1987), Thomas Otto Leucht (11/7/1931 to 7/24/1999), and William Kurt Leucht (2/20/1943). After Verna Irene's death (2/20/1943), he married Alberta Stone (5/16/1903 to 4/1982). Kurt was very artistic and even owned & operated his own sign shop in Peoria. He also was very active in the Peoria Cinema Club. Kurt brought his parents over from Germany in 1926 and they also took up residence in Peoria. Misc: Louise and August were married on 7/17/1880 in Oelsnitz. They had 4 children: Albert Robert Martin (7/20/1880 to ??? ), Arthur Paul Martin (12/28/1884 to 12/22/1961), Olga Camilla Martin (10/3/1882 to 11/8/1941), Curt Albert Martin (5/26/1887 to 6/26/1887). Misc: Hermann was listed as a mill owner at Zaulsdorf. It is unknown if he took over his father's business or started his own mill. Hermann married Friederike Johanna Dorthea Schlegel on 11/7/1896. Hermann and Friederike had one still born child on 8/12/1897. Hermann then married Lina Maria Trampel on 3/25/1899. Hermann and Lina had one child: Alfred Paul Leucht (11/25/1899 to 4/7/1978). Misc: Alma married Christian on 11/7/1891. Misc: Otto was born in Zaulsdorf on 3/14/1869 and baptized at St. Jakobi Lutheran Church in Oelsnitz on 3/21/1869. Otto and Anna were married on 11/30/1895 in Rodersdorf, near Plauen. They had 2 children: Kurt William Leucht (6/17/1896 to 6/4/1976) and Walter Helmuth Leucht (2/27/1901 to 8/15/1962). They came to America in 1926 and settled in Peoria, IL near their oldest son, Kurt. Otto was one of twelve children, and the only one that came to America. He worked as a landscape gardener and was an active member of the Lutheran Church. Anna died on 3/12/1936. Misc: Christian and Christiane were married in Zaulsdorf on 6/22/1850. Christian and Christiane had 12 children: Auguste Pauline Leucht (5/21/1850 to ??? ), Louise Wilhelmine Leucht (7/9/1852 to 12/6/1934), Justus Albin Leucht (9/11/1854 to ??? ), Hermann Robert Leucht (10/30/1856 to 4/16/1941), Ida Alma Leucht (2/25/1859 to ??? ), Gustav Louis Leucht (4/1/1860 to ??? ), Louis Otto Leucht (4/28/1862 to ??? ), child not named (born and died on 2/16/1864), child not named (born and died on 2/10/1865), Alma Lina Leucht (2/10/1866 to 1/1/1960), child not named (born and died on 4/9/1868), and Julius Otto Leucht (3/14/1869 to 1/18/1948). On Julius Otto's Baptism papers, Christian is listed as the "Owner of the mill to Zaulsdorf". Misc: "Leuchtens" is just a genitive form meaning "Leucht's". I guess it's from a baptism entry where they wrote "x, Gottlieb Leicht's baby." Family origination in the small village of Zaulsdorf, Vogtlandkreis, Sachsen, Germany (near Oelsnitz & Plauen). 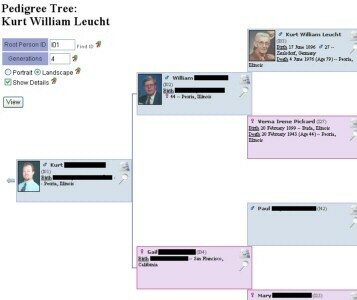 Any additional information relating to the Leucht Family Tree would be greatly appreciated! My dad & stepmom visited Zaulsdorf a few years ago, and they asked some people there if the Leucht house was still there and the gentleman they asked said no, but he kept referring them to the "mueller" or miller and his house was still there. And the Leuchts were the millers of the town for many generations. Yes, it was small, there was a one lane road into the village. Its true. In the house that was a mill lived a family Leucht till 1902. We live since 1996 in Zaulsdorf, but I will try to get more information for you and I will write you again. The name Leucht appears very early in our part of Saxony, the Vogtland. It's mentioned even in the first citizen list of Plauen (1388). Of course it's possible your ancestors came from Franconia but in case that happened it was probably before 1240. "Leucht" is the newer (and High German) spelling of the name. In dialect people still say "Leicht" and that's the way they also spelled it in former centuries. It sounds very similar to the English "light" and it means just the same. Leicht means "light" (weight) but "easy" too. Maybe your oldest ancestor was somebody who took life not too serious. You can find Leuchts/Leichts in our area in many towns and you can trace their lines back to the beginning of the church books (about 1640) but sometimes even much farther back. Many Leichts were farmers, some millers and in bigger towns they were also senators (members of the council) and mayors. Since you know your Gottlieb Leucht was a miller it shouldn't be too difficult to come some generations further back. (Imagine, there is still a "Leuchtsmühlenweg" in our town, named after a mill who belonged to a miller Leucht centuries ago. No, there is nothing left from the mill. It's just a street's name.) You just should start with the church books of St. Jacobi in Oelsnitz. I just suppose your line could go back a little farer east from Oelsnitz and Zaulsdorf (because of the Petzold name that appears usually in the Treuen/Lengenfeld area). There were Leicht millers too in Altmannsgrün close to Treuen in the 17th century. My mom & stepdad visited Leuchtenberg a few years ago, and in this town there is a painting in a restaurant of a man on a horse. The man in this painting, I'm told, bears a striking resemblance to my father, William (Bill) Kurt Leucht! If you have any idea who the man in the painting is, please let us know. "Grundy, Will, LaSalle, & Kendall counties (Il. ), Deaths, Marriages & Births 1840-1879" as extracted from area newspapers. "1870 Grundy Co., Illinois Census"
Email Us or Give Feedback! This website was originally created by Kurt Leucht in July 1999. The current design was created by Kurt Leucht in November of 2014. Thanks to GlowHost for their Web Hosting Services. Click here for unlimited website hosting for only $4.95 a month!